From a British perspective the upcoming WBSS showdown between George Groves and Chris Eubank Junior has Fight of the Year potential all over it. On it’s own, the WBA/IBO super-middleweight unification clash would be a big deal, a great Grudge-Match; but as part of the quite superb tournament it is even more so. Fans seem to be about as split down the middle as can be over who wins this one (another obvious sign of a potentially great battle), yet defending WBA 168 pound ruler Groves sees not only one winner, but one who walks away having left his rival flat on the mat, out cold. 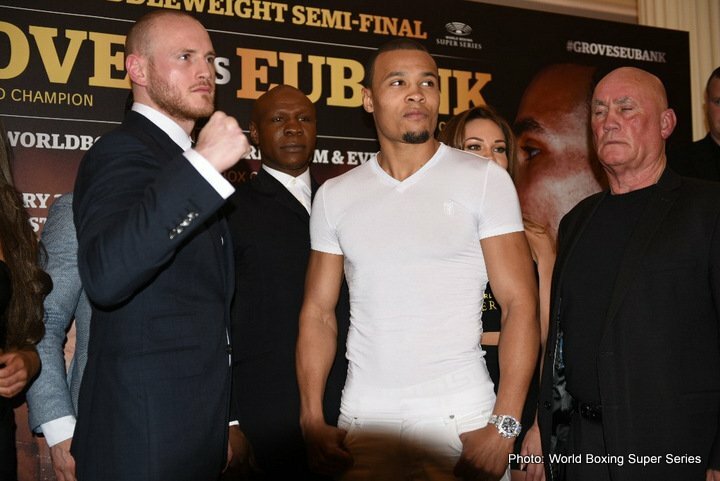 Groves, who has undeniably fought in higher quality company than has the once-beaten Eubank Jr, told Nick Parkinson of ESPN.com how boxing genetics basically count for zero and that he will “ice” the son of the middle and super-middleweight great. If there is anything to the theory of boxing genetics, Eubank Jr may have inherited his dad’s legendary chin. So far no fighter has visibly hurt Eubank Jr and it would, as a result of this, be quite shocking if Groves, 27-3(20) managed to lay his man clean out next month. Eubank Jr has also shown good punching power of his own, but, like his father, also a tendency to fight in spurts, to be somewhat lazy in there. Groves has recently shown a terrific work-rate along with crushing power – stopping his last two foes in impressive fashion. It will be this combination of power and work output that sways the fight Groves’ way, in the opinion of some people, at least. But as for a lights out KO, that would be a surprise – either way. Fans should witness another fabulous 12 rounds of WBSS action on Feb. 17. Groves wins this semi-final. Just.